SAM Moran swapped the Nickelodeon production studio for a local daycare last week during a visit to Gladstone. The former lead singer of The Wiggles made a special visit to the C and K Community Daycare Centre Clinton last Monday. He performed as Play along with Sam - a television show aired on Nick Jr. The visit was a prize to a parent of a child at the centre who had entered a competition. For the past two weeks the children eagerly awaited his visit, room educator Kim Griinke said. "We had a lot of good feedback - they (the parents and children) would love to try getting him back to Gladstone for more shows," she said. "The kids were all very excited." Director Linda Hewson said they had at least 70 children watching the show. "We had extra parents and children come in just for the show," she said. "He sang a few songs off one of his albums - they were getting really in to it." 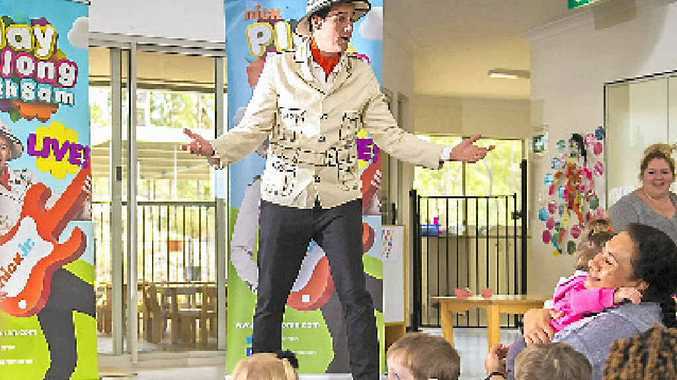 Play Along with Sam visits Gladstone: Play Along with Sam host Sam Moran made a special visit to C and K Community Day Care Centre last week to perform songs from his latest album.